Radiographs (X-rays) allow Dr. Cothern and her team to see the supportive structures of your teeth – a very important element of your dental health and overall well-being. In the past, film-based radiographs took time to develop and used a significant amount of materials in production and storage. 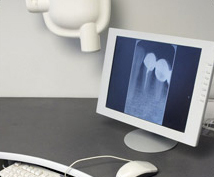 Now, digital radiographs provide your dental team with instant images that can be stored electronically in your computerized patient file. You get an accurate image, more comfortable visit and faster service!